If you're Nokia and Windows Phone smartphone lover and wants to get Nokia's latest edition of Windows Phone Nokia Lumia's Windows Powered smartphone at cheap price now you can get it from Amazon sales as low as the price of just $19.99 and $49.99. Amazon is now offering Nokia Lumia 900 at cheap price of $19.99 and $49.99 for AT&T contact users. The black version of the Windows Phone powered smartphone Nokia Lumia 900 is still the number one best-selling Smartphone on Amazon.com with the contract service of AT&T and the blue version of the Nokia Lumia 900 smartphone is also at number three position on the Amazon list and i think that's an impressive start for any handset and it shows that some people are still willing to try out the Windows Phone powered smartphones and devices. So if you're too Windows Phone and Nokia Lumia smartphone series lover and wants to avail this amazing opportunity than Buy Nokia Lumia 900 @ Price of $49.99 from Amazon now. Nokia Lumia 900 is on sale for $49.99 for all new AT&T customers with a two year contract at Amazon.com and if you're adding a new line to an existing contract that's a 50% savings from its normal $99.99 price and if you already own an AT&T service contract Smartphone and wants to extend your AT&T contract on your existing line, the price for the new Nokia Lumia 900 for you will goes down with an amazing 80% discounted rate for just price of $19.99. 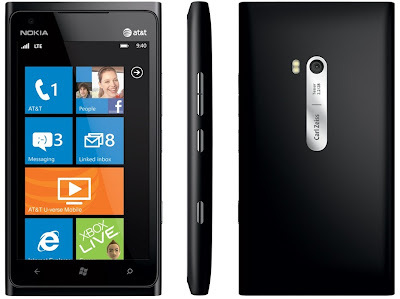 Click here to Buy and Get Nokia Lumia 900 from Amazon Now.